Marina Reid ’19 hovers over a grayish-brown mass of rock and bone with what looks like a dental drill clutched in her right hand. The whir of the tool — it’s officially called an “air scribe” — fills the small room in the basement of Hobbs-Sigler Hall. 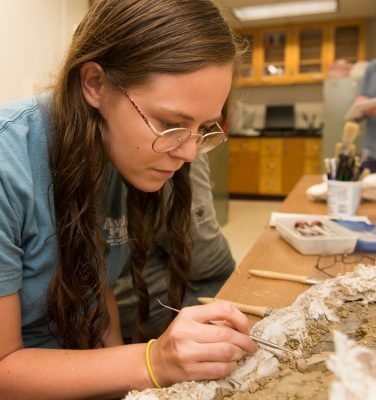 Marina Reid ’19 wields an air chisel to remove rock from dinosaur fossils. Reid carefully wields the air scribe to separate rock from dinosaur bone. The fossil, which is about two feet long and 145 million years old, was brought back from Wyoming last summer, after Dr. Brooke Haiar and her students spent three weeks in the Bighorn Basin digging for dinosaurs. “We think it’s a fibula,” said Ray Vodden, a research technician from the Virginia Museum of Natural History, referring to the bone that, in humans, would be the smaller of the two lower-leg or calf bones. Vodden and his colleague Dr. Alex Hastings, curator of paleontology at the museum in Martinsville, Virginia, came to Lynchburg on Thursday, September 7, to train students in the art of handling dinosaur bones. The museum and Lynchburg have had a partnership for several years. Sauropods — think Brontosaurus — are known for their tiny heads, long necks, big bodies, and long tails. They’re a type of plant-eating dinosaur found in the Bighorn Basin, a fossil-rich area of north-central Wyoming. “All the big-name dinosaurs come out of there,” Vodden said. In 2016, Dr. Haiar and her students brought home 17 “field jackets” — plaster casts that protect fossils — along with 75 smaller items, things like teeth, plant matter and “stomach stones” used in digestion. 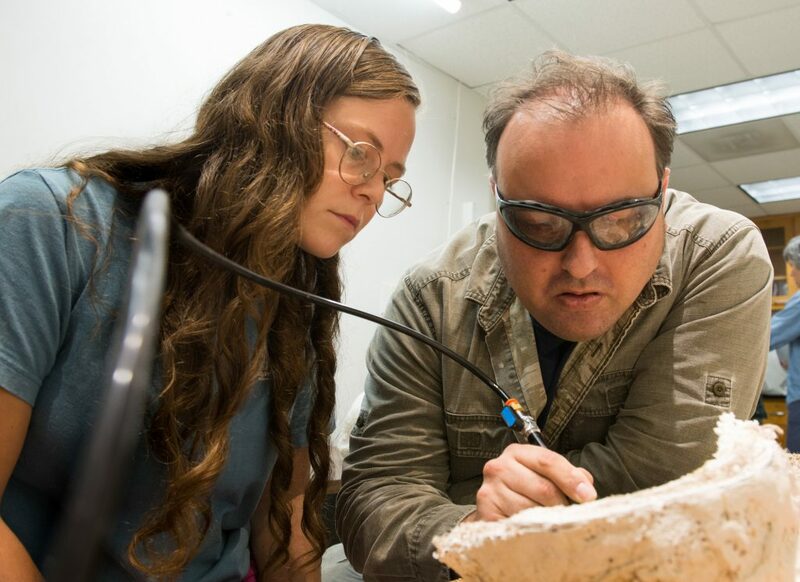 Ray Vodden shows Marina Reid ’19 techniques for removing rock from a dinosaur fossil. All of the items were found in the same quarry on property owned by the Bureau of Land Management. The College has a permit to dig there, and Dr. Haiar and her students have been going every other year. In order to protect the area from fossil poachers, they have to re-bury it after each dig.